Download link to Porchy's website has changed, I 've updated the link on the first page too. And do not hesitate to make a donation to Porchy! First of all, WBML is probably my all time favourite game, I used to head to my local arcade after school as a 12 year old and finish this game on 1 credit (40 cents). I'm very impressed with all the hard work from ppl like mpatou! I'm new to the whole arcade PCB side of things, but I have recently bought a bootleg WBML board off ebay. The first thing I want to do is load up this awesome English version! Can anyone advise which E/PROMS I need to pull of my board and replace with the new ROMS? 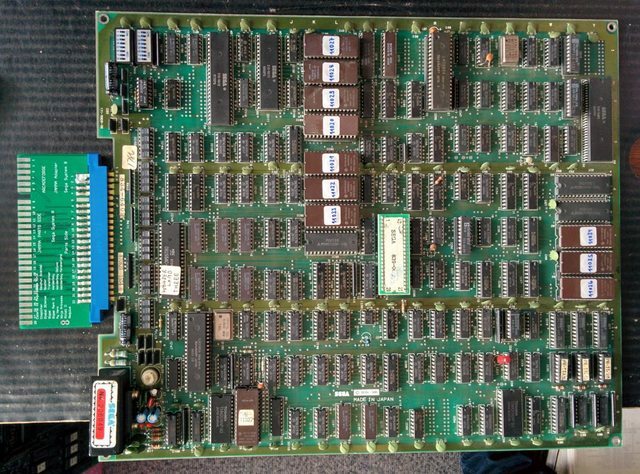 Here is a pic of the board I have bought (hasn't arrived yet, this is the only pic I have of it).. Can clearly see the PROM #'s atleast. Also noticed this board has the single sized daughter board, from what I've seen the majority of WBML bootlegs have a double sized daughter board, guessing mine is fairly rare. I have a bootleg like yours, it should work. Thanks heaps mpatou, I'll let you know how I go. Now all I need is a bunch of eproms, an eprom programmer and an arcade machine! By the way, I ran through a game today in mame, I think it was the vc version, anyway I'm pretty sure it said "flut" instead of "flute" on the part on top of ladder when wboy plays the flute. Obviously nothing critical, but you might be interested. I can send the romset to you if you want, you'll just have to pay for them and for postage. "FLUT"...it was not the VC version of the game, I'm pretty sure about that. 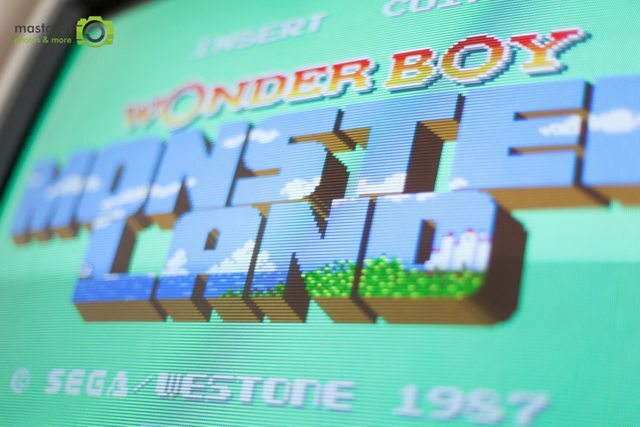 I now have a Wonderboy in Monster Land PCB (well two actually ) so I can finally do this. Mpatou, could you lend your expertise? My two boards differ slightly. Most changes seem like normal production differences, but one board has also been modified. Some traces have been cut and replaced with wire, which lead to a broken pin on IC146. I'd normally not worry about such a repair but I remember you mentioned a similar modification to muddymusic's board. Is this a modification to allow repair with the old unencrypted ROMs and would this cause an issue if I attempt installation of your fixed ROMs? I haven't tested the boards yet. I guess I can check for bugs associated with the old unencrypted roms? PCB 1: Clean of modification. Large NEC chip at IC55. PCB 2: Notice the blue wire (connected to a broken pin on IC146) on the parts side and white wires on the solder side. Standard looking chip at IC55 in place of the NEC. Also, after reading about your monster journey, and your decision to release the roms for free, I want to donate to you. Your PCB n°1 still has the original CPU witch the suicide battery (the big block named NEC MC-81238), and encrypted (japanese) ROMs. If you want to use the english romset I made, you just have to replace ic90 ic91 ic92 ic4 ic5 and ic6 with the 32kB files you can find in the archive. 2-you just use 64kB files provided in the archive for IC90 and IC91 (64kB IC92 file is only for some bootlegs), with soldering or unsoldring anything. Thanks for the information and advice. Hmmmm I'm tempted to keep the PCB 1 for it's original state but I imagine that'd be an easier sell to get my money back, and with PCB 2 being desuicided and modded already there's probably less harm I can do. Regarding the donation, well it wasn't going to be much! Halving it would make it pretty pathetic. I really need to get my art set scanned. Please do. I bought one that came with "original art and copy art" and photographed were two pairs of marquees. One pair printed on A4 and then another pair of correct size that looked reassuringly shabby (one much more so than the other). On arrival only the shabbiest one was original - faded and ripped. The one it was paired with was just a more realistic copy, and in addition to the ultra **** A4 copies. Buying from a translated description didn't help, but I thought that was a pretty misleading photograph. Especially for YHA standards. mpatou wrote: I can send the romset to you if you want, you'll just have to pay for them and for postage. Hi man, sorry if this info was posted elsewhere but how much would the romset cost? I'd like to buy a set if possible? (based in UK). Thanks man, such an amazing project! supertakumar wrote: Hi man, sorry if this info was posted elsewhere but how much would the romset cost? I'd like to buy a set if possible? (based in UK). Thanks man, such an amazing project! If that's a hassle, isn't there a webshop which delivers pre-burned roms? Perhaps it's a good idea to direct people to a place like that. ...Though I'd rather pay you (voluntarily) of course. cools wrote: I really need to get my art set scanned. That would be very good if you could, there's pretty much no art at all available for this game. What I'd like to do is make a mini-dedicated cab from a Mushi King, but haven't had any art at all to work from. I wasn't even sure if there was anything! pubjoe wrote: Thanks for the information and advice. If someone need proper programmed eprom, I can send it, you just pay for material and shipping.